Estampe sells night drop envelope that are in-stock and ready to ship the same day. We can also match your current envelope or help you design a custom drop-off envelope to match specific requirements. 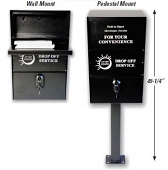 We sell other night drop supplies such as self-contained night drop boxes. Please call Estampe at 1-866-348-6414 so we can assist you in designing a new night drop envelope, or save you money by matching your existing envelope.